As we’re in the final mile of the project, there are quite a lot of little details that need polishing. Not the most fun work – but gotta be done. 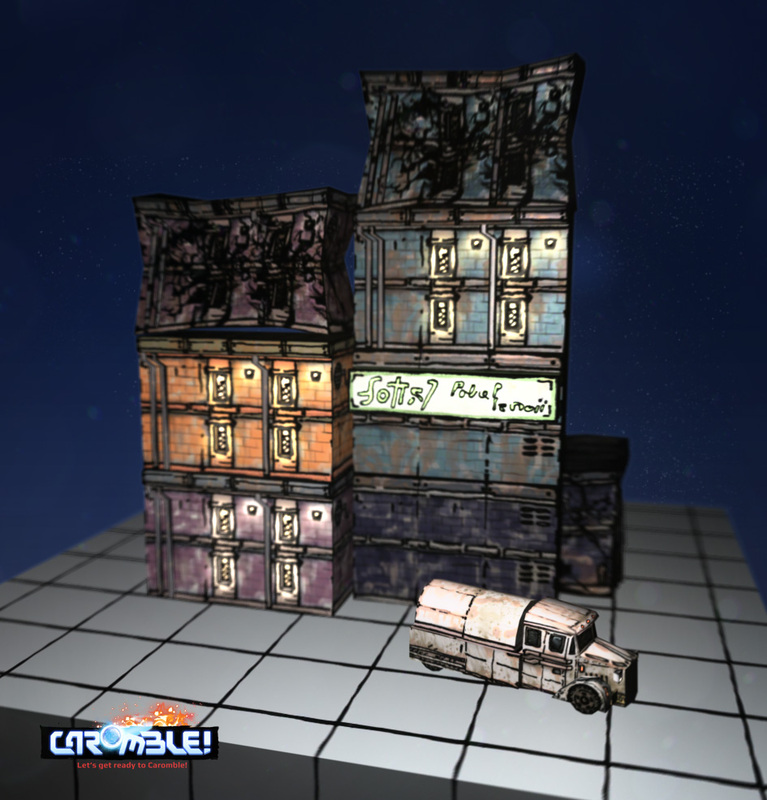 Girders and metal bars are used all over the game, and used still some early test textures without final effects like normal maps. So now I redid all of them, fixed all errors – and brushed them up to the style of the other objects. That will also help to make the game look consistent. And menu stuff – little navigation arrows and medals for the achievements. 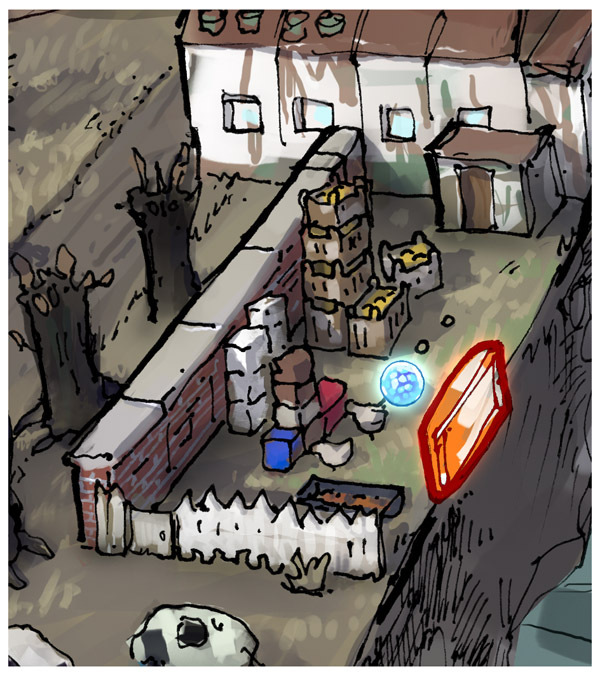 And the endboss you will meet every chapter got updated – we’re still tweaking the gameplay. Beware: He can now shoot back! The “alien” – got a new home.. and weapons. In our previous posts we talked a lot about juice. But in those posts, we mainly focused on main gameplay events and objects. As you might know, we more or less have all our levels finished. 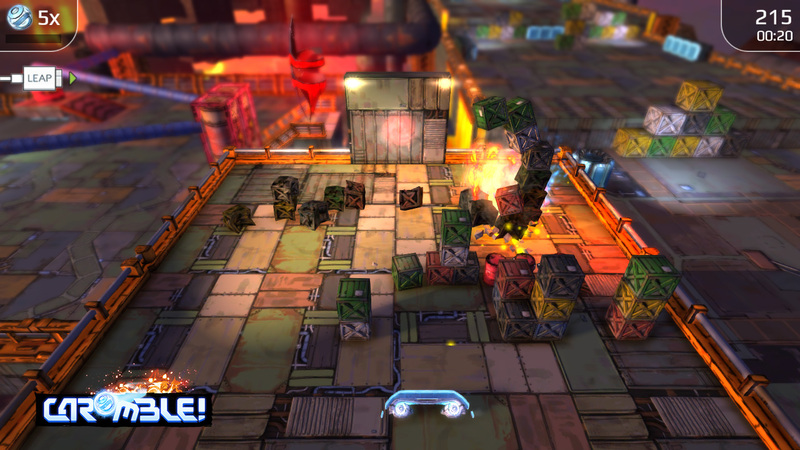 The gameplay stands, but the levels are all pretty rough around the edges. We’re currently iterating over the first few levels. With each iteration, the gameplay is tweaked a little more and the graphics and lighting are made more coherent. PS: We know we’ve been a bit silent on the blog lately… but believe me, it’s the calm before the storm! A couple of weeks ago Thomas Schmall posted an article about the new particle systems he was working on. I finally got around implementing the last system, the spark particles. I would like to show you two ways we can use this particle system, and give a brief insight in how the Caromble! Editor can be used to place and tweak it. The first way of using the system is to emulate sparks generated by something like welding. They spray out in a coherent beam. This effect works best if the sparks aren’t spawned all the time, so I’ve used a timer to spawn a spray of particles every couple of seconds. In the screenshot to the right you see this timer. I’ve set it to send an event every 2-5 seconds. Now we just need to place the actual spark particle system itself, and fiddle with the parameters a bit to get the effect we want. I’ve included a screenshot of the relevant bit of the editor screen below. Five properties are important for this effect. First of, it is important to set the release rate (very) high. The release rate is the amount of particles we’ll spawn per second, and since we’ll only spawn particles every once in a while, we need to spawn a lot of them in this small period of time. A less obvious parameter is the “ContinuousParticles” property, which is ticked of to indicate that we’ll provide external triggers for the particle system. The important settings for the spark particle system. Next to that is the “PulseDuration”, which determines how long we’ll spawn particles after every trigger. The collision object property determines which objects the particles will bounce of. For performance reasons we won’t bother the physics engine with all particles, so you’ll have to provide a list of objects with which the sparks can interact. Finally the “MaxAngleRadian” property determines in what direction the particles will be spawned. Since this is meant to be a coherent spray, I’ve set the angle fairly low. 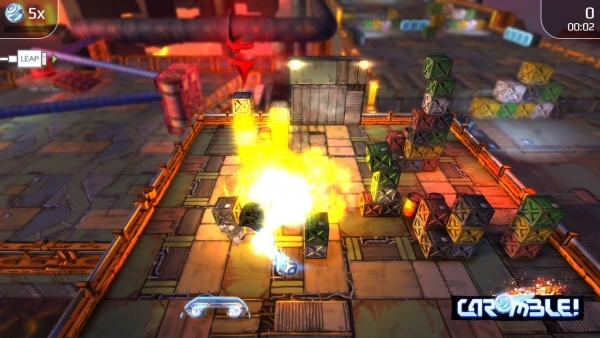 Alternatively the spark particle system can be used in a more continuous way, as shown below. To use the sparks in this way, you don’t need an external trigger, the particles will continuously spawn, and Perlin noise is used to control the release rate of the particles. Again I’ve highlighted some important properties for this system. The upper triplet of properties control the release rate animation in a somewhat mysterious manner. The “FractionOff” number corresponds to the fraction of time that there should be very little particles (the lower bound of the release rate). The “ReleaseRateAnimationSpeed” determines how fast the animation over the release rate is running. The other five highlighted properties determine the way the particles look. The “MaxAngle” is much higher than it was in the beam example, it now corresponds to a halve sphere. 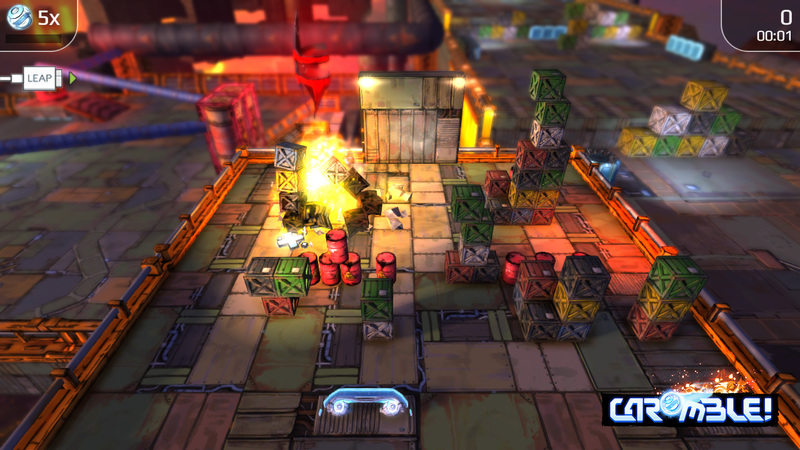 The “StartSpeed” and the “Gravity” property together control how the particles will act after they have been released. They have to be tweaked together to achieve the desired effect. Finally the “MinLifeTime” and “MaxLifeTime” parameters dictate how long the individual sparks will exist on this planet. With that I’ll conclude this post. I was hoping to provide a small peek into the daily live of us Caromble! developers, and about the tools we have made to work with. We might release the editor with the game (or at a later stage) so you might get a chance to tinker with it too. Also, if you have any questions or suggestions, please don’t hesitate to ask! On the art side I can slowly move towards polishing, as at least the industrial set is basically finished. One thing that I really want to tidy up are the effects. My thinking is that if they are in style, then the whole look will come together much more. It would be combined with smoke, and also sparks. Here is the animation for it, which would only really work in motion. A spark – supposed to be many that fly around. And here is the explosion. Here are some screenshots of the explosion in action. Sphere Evolution – Now in 3D! In the last art posting here, I showed the concepting steps of the sphere. Here is the progress on the 3D side of things. These were the meshes I created to choose from. It’s quite a lot – but it is of course in important asset of the game. We chose number four – and the team basically said “works really well, don’t touch it anymore”. The visibility is much better – and the rolling motion shows more clearly. There might be an option to use the other versions as addons or bonuses. Here is a is the work as a still image to enjoy ;). 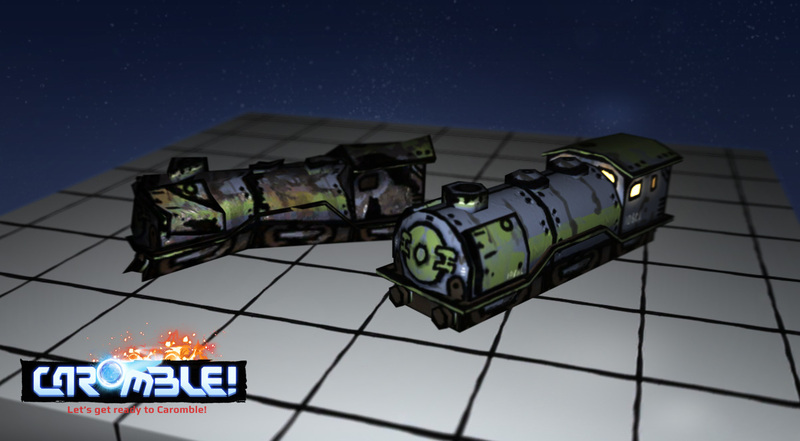 In the later stages I might tweak it still, to add the outline look that all other assets have. By now, there has been quite some evolution of the sphere throughout the development. Uh, makes me feel nostalgic. 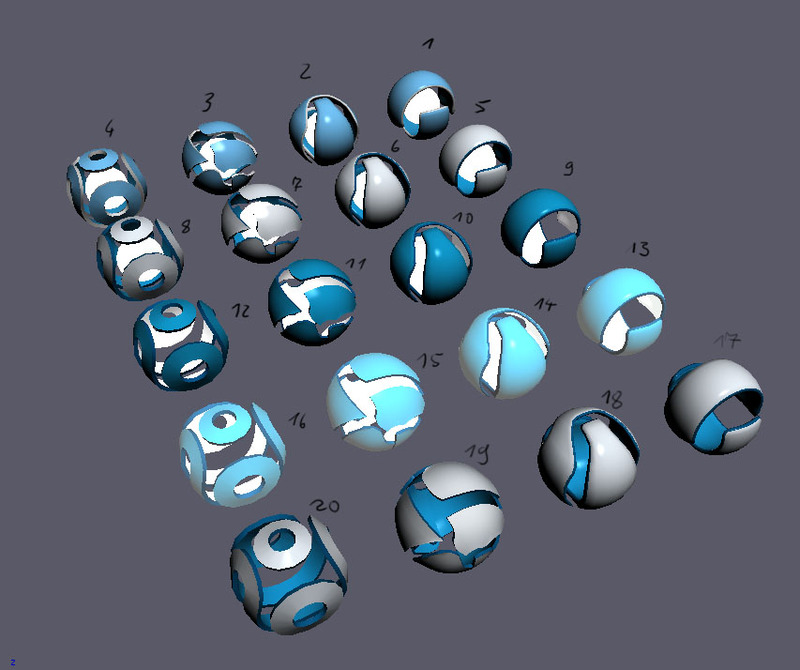 The progress of the sphere mesh. After showing how the art of the alien art evolved, here is an update on the sphere, that now is closing towards final. 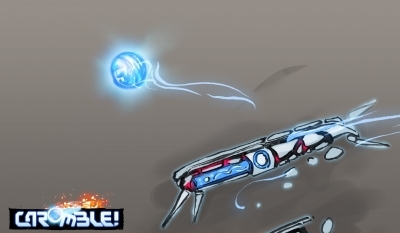 The first concepts already had it as a blue glowing object with some pattern on it. And it stayed that way for quite a while, whereas I tried around with making the pattern more readable. That wasn’t quite readable still, mostly because of the light effects in the game. So here are some concepts that add a 3D shape, with more contrast, so that the sphere would work in dark as well as bright areas. After choosing colors from there, I worked on the shape. I really liked the idea of having a glowing core inside. Next time I’ll show how it looked in the game. 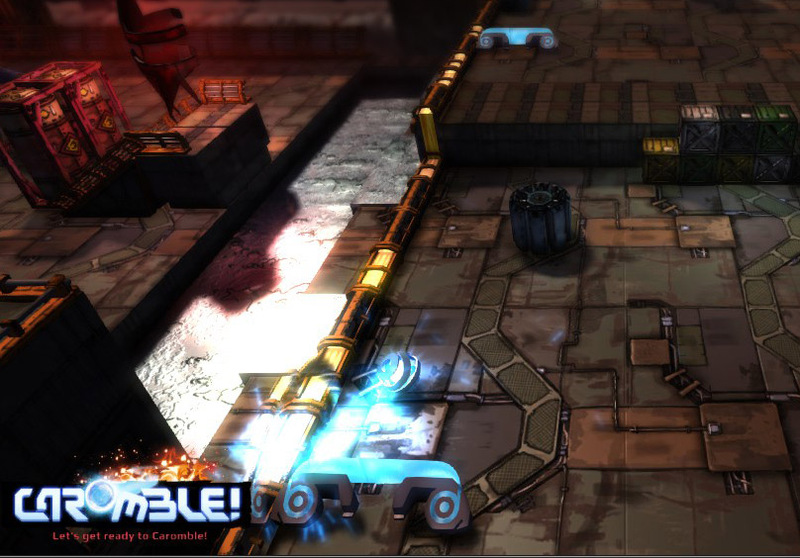 As the gameplay of Caromble! is zeroing in on the final outcome, it’s time to do the same for the look of important assets of the game. This is a view of how the Alien design evolved. The style matures over the course of a development, so it’s always a good bet to do these items at the last, to have them at their best. Background story and gameplay are still somewhat in flux, but little enough to give this a shot. Above are three old iterations – with the first being from the very earliest posting about the alien concept. It became already more creature-like in the step some months later. And in the next version, when the game-story was defined, it became even more of a vicious actor. We decided based on the latest story iteration, that the alien would hold items. So this is a very recent redesign – making it more into a shell. The team chose the variation they liked. And since we’ve noticed when we showed the game that players sometimes didn’t know what to make of this thing (is it good or bad), the request was to add even more personality. So now the features look more like eyes, and I’ve added something like a mouth. So here is the final version, that will make it’s step into 3D soon.